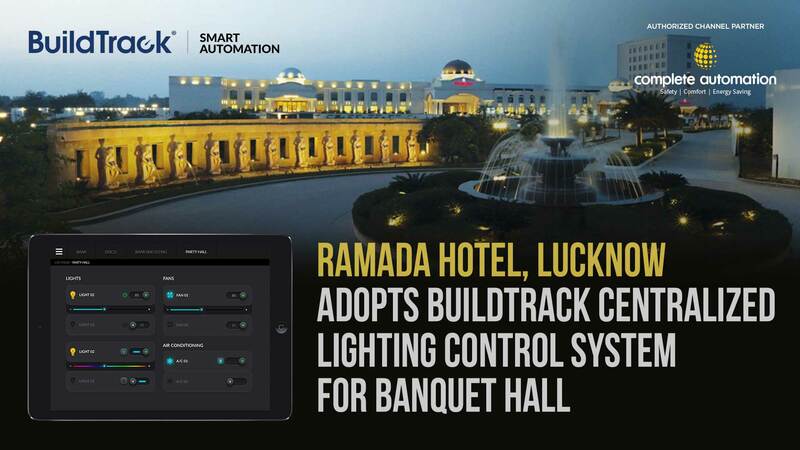 BuildTrack’s Channel Partner from Delhi, Complete Automation Technologies, recently completed installation of Centralized Lighting Automation Solutions at one of the biggest hotels in Lucknow, Ramada. Ramada hotel opted for the system which enabled both control of banquet halls lights and for dimming. Manual operation of the lights was enabled through BuildTrack touch switches along with SmartApp and browser based App control. The facility manager controls these lights centrally using his desktop computer or uses his smartphones while he moves around the facility. The hotel owners and operators have been delighted by simple, user friendly, responsive and energy efficiency enabling solution by BuildTrack. They solution enables them multiple functions including Master ON/OFF; Zone-based Dimming; Mood or Profile based Dimming, Scheduling and more. Learn more about Centralized Control and Smart Automation for Energy Efficiency. About Ramada Hotel (https://ramadalucknow.com/about-ramada-lucknow/): Ramada Lucknow is located in the city’s commercial suburb, offering an extensive, never-before range of world-class hospitality & event facilities for the erstwhile City of Nawabs. With contemporary design that brilliantly melds the individuality of Mughal-infused aesthetic articulations, the hotel & convention centre, spread over 10 acres, is ideal for business, MICE and leisure guests.